As often found with co-product feed ingredients, these have unique nutrient profiles and physical characteristics that require attention when formulating diets. They often can serve multiple roles in diet formulation: energy, protein, or forage. Many producers are simply unfamiliar with the effect of DDGS or SH on diet palatability, level of performance, cost effectiveness, and health status. 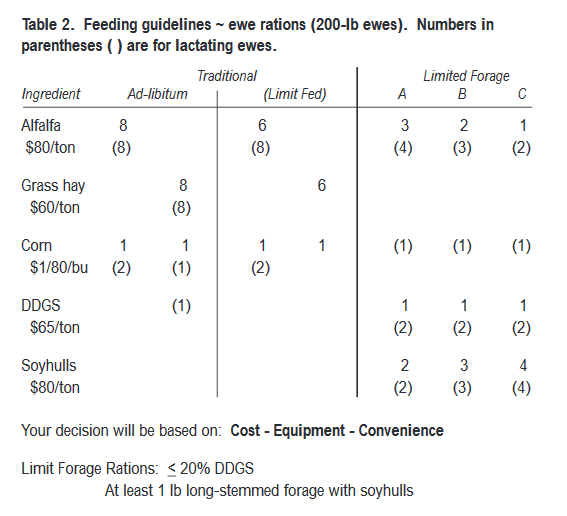 For sheep producers the key attractions of these feeds are cost effectiveness, animal performance, and reduced labor. The key physical characteristic that offers diet formulation flexibility is the high fiber and low starch content. Both DDGS and SH are energy-dense feeds that can safely replace a portion of traditional forage or grain in diets, since the high fiber-low starch physical characteristics have lower rumen acidosis potential compared to grain-based diets. 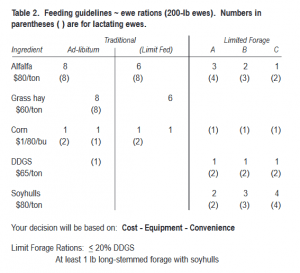 Cost per pound of nutrient will influence their inclusion into sheep diets. 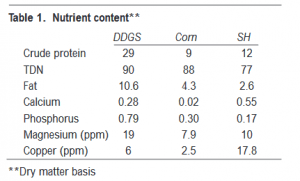 Economically, DDGS is currently best suited to serve as a protein feed since it competes most favorably with traditional protein feeds like soybean meal. Pelleted SH can be an economical source of forage or serve as an energy feedstuff substituting for corn or barley. 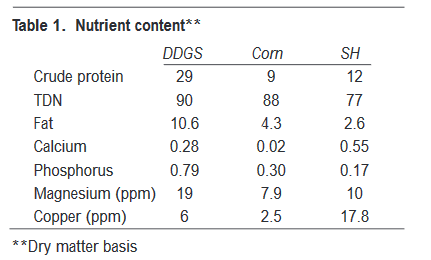 For nutrient content, see Table 1. Using pelleted SH for mature breeding ewes as a forage source has increased dramatically across the Upper Midwest during the past 5 years, especially in drought stricken areas. Studies with growing lambs fed SH based diets have reported excellent growth performance and palatability. Soy hulls stimulate intake; studies demonstrate that intake increases linearly with higher levels of soy hulls. Although SH is a high fiber feedstuff, the rate and extent of fermentation in the rumen is rapid, leading to increased rate of passage; it is these features that contribute to increased feed intake. Growing lambs fed a diet containing 70% SH had a reported dry matter intake equivalent to 4.5% of animal body weight. Compared to more traditional corn based diets, lamb dry matter intake of SH is often increased by 0.5 to 1.0% of animal body weight. 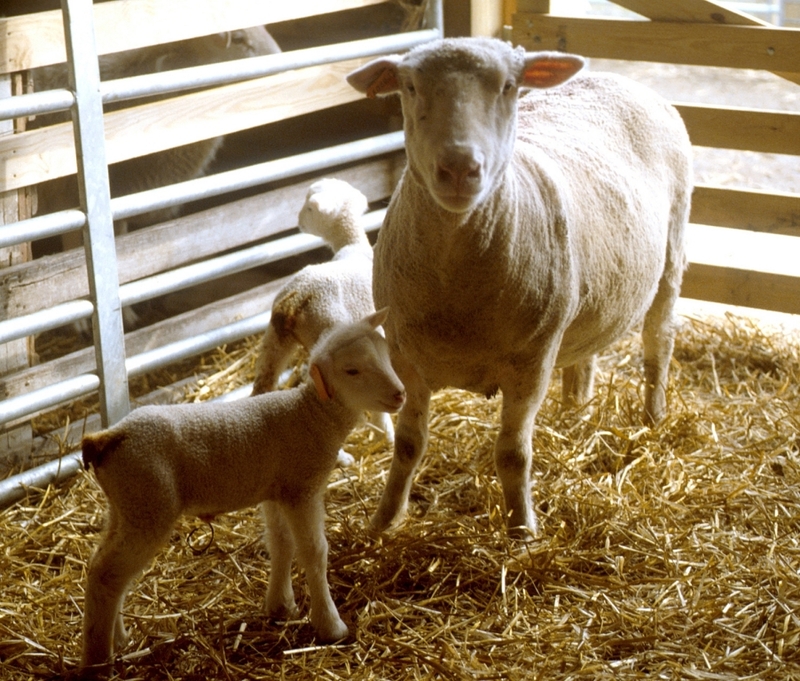 Ewe lactation studies using DDGS compared to soybean meal as a protein supplement show no difference in ewe body condition score or suckling lamb gain. A lactation study using DDGS to replace 2/3 of the grain (corn), equating to 25% of the diet, improved triplet- reared lamb growth performance by 12%. There was no difference in single and twin reared lambs. Studies using DDGS in lamb growing-finishing diets are scarce. This lack of DDGS research could be related to current general lamb feeding practices: Lamb rations are generally offered ad-lib in self-feeders with maximum expected gain. Pelleted lamb protein supplements containing protein, minerals, vitamins, and feed additives are commonly used to reduce feed ingredient sorting and refusal. However, the high cost of commercially manufactured lamb protein supplements has created producer interest in inclusion of DDGS and other co-products in lamb diets. Since the level of crude protein in DDGS is approximately 40% lower than in soybean meal (30 vs. 48% CP), the cost per unit of crude protein will need to favor DDGS to substitute for soybean meal in mixed lamb diets. Even when the economics favor DDGS the high inclusion rate adds considerably more phosphorus to the diet, creating greater diet formulation challenges. Editors Note: Please note that the values found in Table 2 are reflective of ingredient pricing when the article was first published in 2006. Posted by Braden Campbell at 8:00am August 15, 2018 Posted in Nutrition, Research and tagged Nutrition, Research. Bookmark the permalink.